Through our continuous evaluations and research, we have the proof that Educare is working to help improve outcomes for our children and their families. Educare tracks program quality and child outcomes with the Educare Implementation Study. By placing a strong emphasis on parent engagement, Educare helps promote their involvement in their child’s education, leading to strong parent-child relationships. Our data shows that Educare parents engage actively with their children’s learning, which is important for their long-term success. 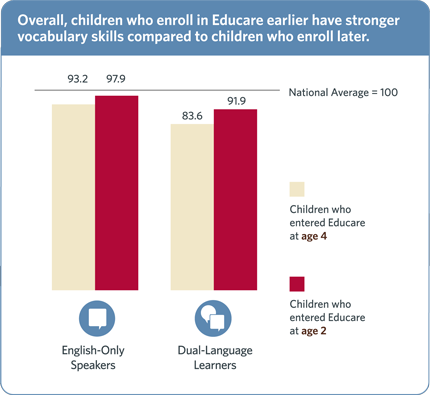 Students, on average, retain the skills they gained at Educare relative to their same-age peers, as shown by studies tracking students’ progress into elementary school. We partner with leading research institutions to continuously evaluate our schools so that we can make improvements to ensure that we are providing the highest quality program for our children and families.